This is not the Siberia you that is popularly imagined, featuring steppe, the Mongolian gazelle breed of antelope (its only habitat in Russia), manul cats and many globetrotting birds who take a layover here during long flights that cross oceans. Traveling in Dauria Reserve in Transbaikal Region (4850 kilometers from Moscow) is a wonderful opportunity not to see the many contrasts of the taiga, but to experience the calm steppes of Siberia: soft hills, rare antelope breeds, three-dimensional cosmic landscapes and rocks in the middle of feather-grass meadows. This is a chance to encounter Asia as you’ve never seen it, combining Siberian vastness, a Mongolian meditative calm and Chinese diversity. Dauria, a part of which makes up the eponymous reserve, is steppe as far as the eye can see, pine forests and savannas, low soft hills and numerous small warm salt lakes. This huge ecoregion is located in the center of the Eurasian mainland and has united Russia, Mongolia and China since ancient times. In 2014 the Dauria International Protected Area (DIPA), which is made up of the Dalainor reserve in China, the carefully protected Mongol Daguur territory in Mongolia and the Dauria reserve in Russia, turned 20 years old. This is one of the newest and most beautiful tourist reserves in Russia. Perhaps the most interesting route to travel through the reserve is the «Zapovedny Torei.» It leads past the enormous and unusual lakes Zun-Torei and Burun-Torei, which have amazed visitors for hundreds of years with its metamorphoses. Once in 30 years these lakes dry out and then reappear. The most beautiful views of the lake are from the hills Chikhalan and Kuku-Khodan, where prehistoric man once lived. These milky water bodies (where you can swim) are a very important bird resting area in Asia, as the Dauria Reserve is located at the crossroads of two global migration routes for millions of birds: the East Asian-Australian and the Central Asian-Indian. Ornithologists come here from all over Russia and around the world as rare birds build nests here during the migration season and rest after long trans-oceanic flights, including the Japanese, the Dauria crane, the white crane, bustards and the relict gull. It is a real birdwatcher's paradise! Bird watching is for the patient: you need to take into account the season and discuss the visit with the administration of the reserve. But many graceful cranes can be seen on the lakes' shores, as if straight out of a nature book. But the most amazing thing on this route of the reserve is seeing a gazelle, a small and graceful Mongolian antelope, easily crossing the vast expanses of the steppe. Small herds of gazelles can be seen at a distance of 50-200 meters when driving along Zun-Torei Lake. These hoofed animals are shy, but you can see their sand-gray color and expressive faces through binoculars. The 20th century was a dramatic one for the gazelle. In Mongolia they helped the army with their harvests. In Russia by 1970 because of snowy winters, the availability of hunting weapons, a lack of environmental regulations and widespread poaching, the extermination of the Mongolian gazelle in the Trans-Baikal, Altai and Tuva regions was almost accomplished. But after an intensive multi-year program to restore the Mongolian gazelle in the Transbaikal Region, the reserve was able to revive the population of these animals in Russia. To see these animals up close in their native habitat is a wonderful thing. Visitors will be constantly filled with wonder at the Dauria Reserve. Here in the steppe, which is considered endless and separates the earth from the sky, is the wondrous rock massif Adon-Chelon. From the Mongolian Adon-Chelon translates as a «herd of stone horses.» Locals have created a legend connected with the rocks. Once upon a time in the area grazed large herds of horses, which beat all snakes with its hooves that slithered in the grass near the rocks. As time passed, the horses turned into motionless stones and the snakes did not return. Today near Adon-Chelon there are no snakes, but there are lizards, and wild manul cats hide in the rocks. The manul is not only a rare animal, but is also a popular Russian internet meme. Finding a manul cat (it is nicknamed the "ugly ear") in the rocks is almost impossible: it is a very secretive and cautious cat; it is easiest to find one in winter. But even the possibility of seeing Siberia's amusing and portly cat with its flattened ears causes travelers to gaze into cracks and holes in the rocks. This remarkable rock massif is approximately 145-170 million years old. It is hardly surprising that many of its cliffs resemble ancient fossilized creatures. The cliffs' titles reference Asian mythology, with such names as "defeated dragon," "chameleon" and "water of the sky." A few hours is not enough to take in the wealth of shapes, textures, plants and the panorama of Dauria's humpbacked silhouette. A walk through the steppe of Adon-Chelon is akin to peaceful meditation. 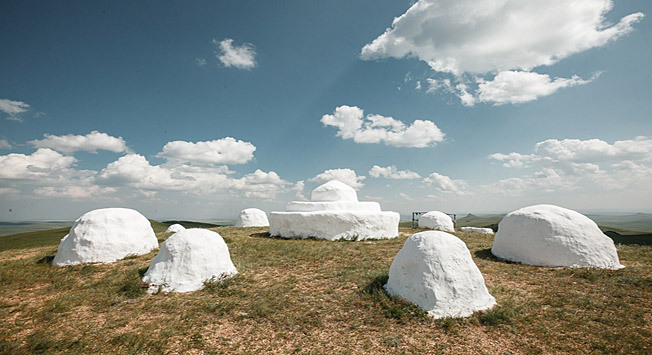 On the highest mountain of Adon-Chelon, Tsagan-Obo, at a height of 985 meters above sea level is a shrine for local Buryats, which according to legend came here before the arrival of Buddhism in the Daurian steppe. An “oboo” is a cone-shaped religious building made of stones or tree trunks, a small stone complex where Buryats perform rituals and leave coins, patterned silk ribbons, figurines of animals, food and tobacco. Hundreds of believers and lamas from the nearby temples come here in the summer for a large prayer service. “Oboo” and cults associated with these facilities have a long and complicated history. Unfortunately, much still remains to be studied about them. But researchers believe that in today’s popular Buryat veneration, war commanders, ancestors, weapons and mountains have all been merged together.